I just gave my State of the Lab address to orient the newest students joining the group to the ways of the lab. I have described the State of the Lab address before here, here, and here. In that address, I have a slide on how important it is to rest in science and to take breaks. It is very important to get a good nights sleep. It is essential to stop and eat. Doing exercise is also good for the body and mind. Taking breaks and getting sleep gives your mind a chance to work out solutions to problems. Ultimately, it makes you more productive to take these breaks. In the lab, I have been known to supply modeling clay for students to use during breaks. We ended up with a wonderful menagerie of little animals thanks to these breaks. The entire discussion was prompted by the fact that I sometimes get a very hardworking and dedicated student who starts doing overnight runs and working non-stop. Inevitably, their Productivity goes down. I think that people of all ranks and stations do not realize that Productivity is not always a linear function of Effort. 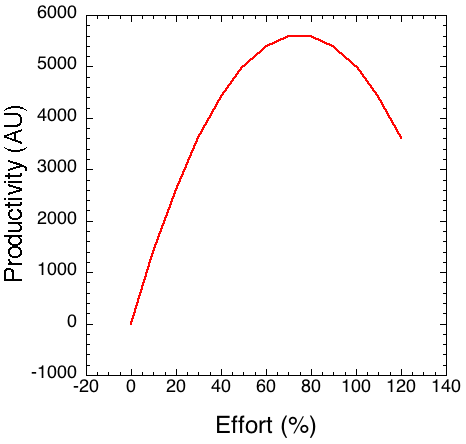 Figure 1 shows the true dependence of Productivity on Effort, which is really more of a parabola. I want my students to be in the linear regime of the curve. Although this is not the most productive location, the linear regime is good because if they need to give a little more Effort it will likely result in more Productivity. Indeed, being up at the apex, which does maximize Productivity, is very dangerous. If you need to add a bit more Effort, you will actually be less Productive. Further, that’s the region where small mistakes could cause accidents in the lab. I was thinking about this over the past 2 weeks because I am living at or near the apex currently. Even my students told me that I need to get back into the linear part of the curve. They are right. I am running myself ragged, and it is only the second week of classes. This is because I am co-teaching 440 students in 2 sections for the first time and flipping the class to boot. The email burden alone is astounding. The most stressful part for me is having 30-50 unread emails in my inbox all day. I don’t even read them because I don’t have time to respond, so I read and respond in the evenings. This has been perhaps the most stressful, and I did not realize how much anxiety this would give me. In addition, I had a paper returned from review that needed to be revised with 10 days (that’s the shortest turn around time I ever had). Before I was given this teaching assignment (mid-semester last fall), I already made arrangements to travel 3 weeks during this semester for conferences. I am planning to use this time to actually work on research during the semester, which I would probably not have the opportunity for if I wasn’t co-teaching. I have two half-finished manuscripts that I need to get out before spring break! My service has also picked way up, and I am just barely performing there. I dropped out of a few of the less important service items – even though one was university-wide. I should say that even though I feel like I am at the apex, or perhaps past it, I am still getting 8 hours of sleep per night. Somehow I magically found Friday was easier, so it could just have been an adjustment period? Or maybe all the students don’t do my class on Friday. Only time will tell. So, I finally did have time to write this post on Saturday night. So, where are you sitting on the Effort-Productivity curve? Post or comment!